Published on February 2, 2015 by Rachelle J. Currently Reading: The Very Best of Kate Elliott, a review book, The Sparrow by Mary Doria Russell, Little Women by Louisa May Alcott for The Classics Club, 1536: The Year that Changed Henry VIII by Suzannah Lipscomb, for one of my college classes, and War and Peace by Leo Tolstoy, because I’m insane. Also, there’s a read-along for it. Winter 2014-2015 COYER Progress: I’ve read 7 books towards my goal of 10, and participated in 2 read-a-thons towards my goal of 3. I’ve been keeping up with the Facebook group, but I still need to do a mini-challenge. 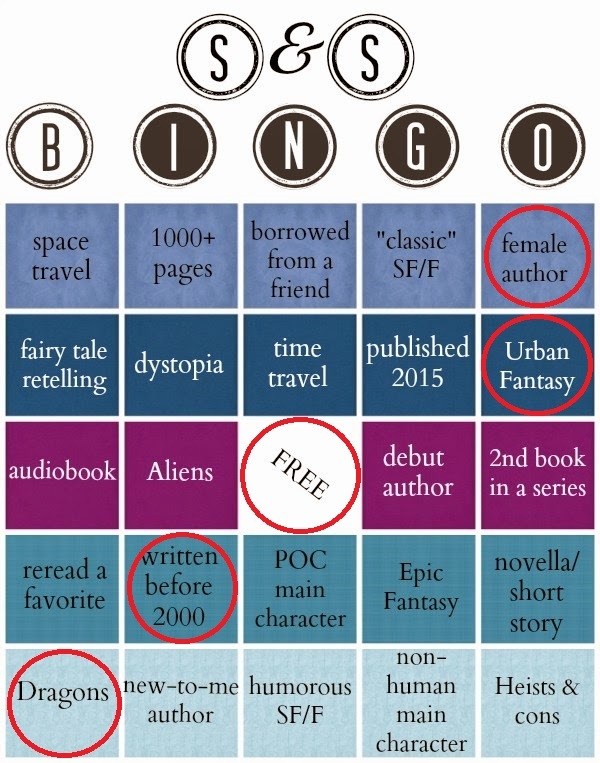 SF/F Bingo: I may end up moving these around a bit, but so far I only need to read a book published this year. The Very Best of Kate Elliott will qualify for that. I’ve read a book containing dragons (The Sunken by S.C. Green), a book by a female author (The Eterna Files), a book published prior to 2000 (Walking the Labyrinth by Lisa Goldstein) and an Urban Fantasy (The Kingdom Lights by Steven V.S.). My “Free” book is Tommy Black and the Staff of Light by Jake Kerr). Total number of books for the year: 7. I’m still technically ahead of schedule, but unless I finish The Very Best of Kate Elliott by Friday, I’ll be behind by the end of the week. I decided to cut Friday’s Fairy Tales down, again, to monthly, which is why there wasn’t a post on Friday, and I’m probably going to cut back Wednesday’s Words to every other week. I’m already seeing a slight reduction in traffic, but earning my degree has to come first. At this rate, I don’t think I’m going to complete most of the challenges I’m participating in, but we’ll see. It’s only the 2nd month of the year, and last year started strong and then slowed around the same time. Top Commenters: This week, my Top Commenter was Shaina from Shaina Reads. Your education definitely comes first! Whatever you accomplish will be a triumph with such a busy schedule. Wow, you’re almost done with my year-long challenge and it’s only been a month! I’m probably going to try to fill the whole card, but I’m not sure yet, since my reading has slowed down considerably with the start of the semester.